This personality-filled graduation announcement caught our eye and made us want to find out more about this young woman. As we suspected, there’s more to her than meets the eye. As if gradating from high school wasn’t enough, this ambitious grad is also graduating from a community college at the same time, having completed all the requirements for an associate degree while in high school. 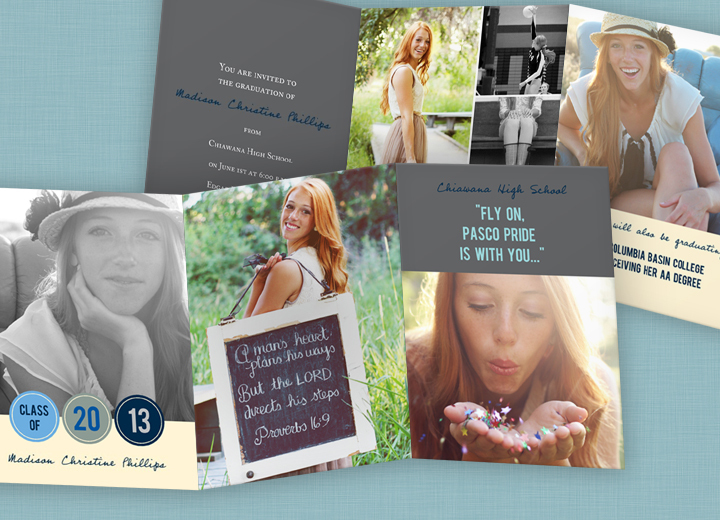 Not only that, she came up with her own graduation announcement ideas and created it herself! Incorporating a phrase from her school’s fight song, “Fly on Pasco Pride is with you,” is another of her graduation announcement ideas that we loved, along with the chalkboard proverb. Through her use of photos and carefully chosen text, she is giving her friends and family a wonderful memento of this important time in her life. Fly on, Madison. You have a bright future ahead of you!